Our new #BestInClass PVC Flush Sash is stunning in looks and leads in performance. The Heritage Flush sash is outstanding across the board with superb energy performance, security and durability. Our Heritage Flush Sash double glazed windows achieve an A+ energy rating, providing superb thermal insulation. We also offer triple glazed windows with a A++ rating for the best in energy efficiency and comfort in the home. 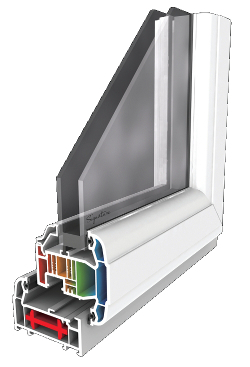 Internally the Flush Sash uses Deceuninck's tried and tested high performance multifunctional weatherseal. With a continuous seal welded at the corners, air tightness is always maintained meaning no loss of comfort inside the home. Externally a new dual seal combination maximises water tightness and conceals hardware. An integral drainage slope encourages water to drain away quickly and easily. The Deceuninck flush sash had the homeowner in mind during its design, so unlike others there’s no compromise when it comes to things like having a night vent locking position. 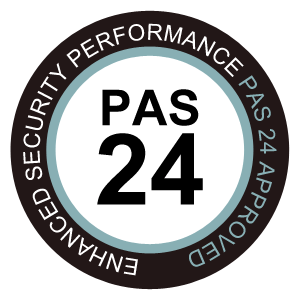 The bespoke locking keep also means full hardware compatibility, giving the window unrivalled security for a product of this type… achieving PAS24 just got a whole lot easier. It’s the prettiest of Deceuninck’s pretty windows, transforming old and new properties from modern townhouses to country cottages. It suites with our existing Heritage system and includes a unique night vent position. All our products undergo rigorous tests to ensure they are of the highest quality, durability and reliability. So your windows and doors will stay beautiful for longer, with very little maintenance. They are also all recyclable. Available in 26 colourways from stock. Each colour has its own matching ancillaries, trims and accessories. Get on the phone to us now for a competitive quote - just call 01245 362236 or if you prefer you can use our Web Enquiry Form and we will answer any enquiries that you may have. Pioneer have added the Deceuninck range to our repertoire, due to Deceunincks; Best in Class products, the Flush Sash and Slider24 Patio door, as well as being able to supply 26 colourways from stock. Pioneer has developed its own profile, known as Signature, the most advanced window system available! Pioneer Trading Company is now offering a new security locking system on all Double Glazed uPVC windows. © 2016 Pioneer Trading Company Ltd.